What is the single best piece of marketing advice you have ever received? Now, that’s a question — and you can see some rather intriguing (and a few off-the-wall) answers in this Quora.com thread. 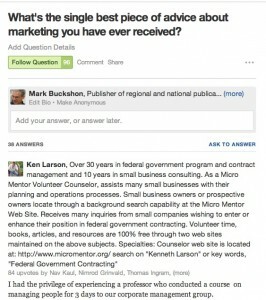 Ken Larson, a small business consultant serving clients seeking U.S. federal government contracting work, so far has received the most votes for his answer, where he advocates looking closely at the values and interests of your potential clients, and making sure that any of your marketing and business development work aligns with these values. 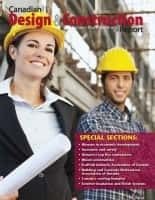 Even if you have a better mousetrap, you won’t get very far until you can connect with your potential clients, win their trust, and then show you how what you have in mind associates with their inner values. I had the privilege of experiencing a professor who conducted a course on managing people for three days to our corporate management group. For those three days the instructor did not allow us to use the word, “Problem”. His message was that there are no such things as problems – just situations that threaten or further peoples’ (or the corporate culture values). I used not only his theory, but his mode of presentation successfully for 25 years thereafter. I never conducted a lecture course again, interacting with business audiences perpetually instead, on a participation and question and answer basis, and staying away from the word, “Problem” like it was the plague. Find what your management or those you are trying to influence value, present a plan to threaten or further those ends and you will get action. 5. 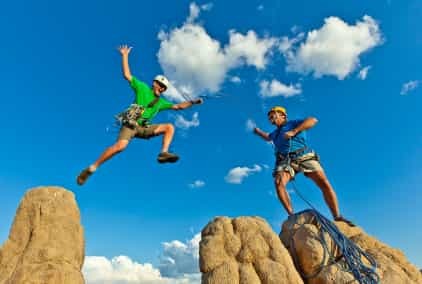 Why is your product or service the best to further the client’s personal value system and motives? You can read the rest of his thoughts — and see some of the other answers — in this thread. 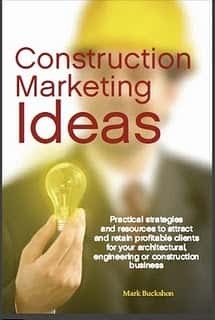 Now, in a practical sense, this form of marketing reaches closer to the business development level — you are focusing on individual potential clients and seeing to develop rapport and trust. Yet these concepts have validity when you think about the bigger picture of how you will approach and connect and introduce your product/service or concept to potential clients, even if they are so far outside of your direct vision. Next articleCredentials and marketing — How much do they count?